Digoxin poisoning, also known as digoxin toxicity, is a type of poisoning that may occur in people who take too much of the drug digoxin in a short period of time or in those who accumulate high levels of digoxin in their blood during long-term treatment. Digoxin (derived from foxglove plants of the genus Digitalis) is a medication prescribed to people with heart failure and/or atrial fibrillation. Digoxin toxicity is often divided into acute or chronic toxicity. In both of these toxicity, cardiac effects are of the greatest concern. With an acute ingestion, symptoms such as nausea, vertigo, and vomiting are prominent. On the other hand, nonspecific symptoms are more predominate in chronic toxicity. These symptoms include fatigue, malaise, and visual disturbances. The classic features of digoxin toxicity are nausea, vomiting, diarrhea, abdominal pain, headache, dizziness, confusion, delirium, vision disturbance (blurred or yellow vision). It is also associated with cardiac disturbances including irregular heartbeat, ventricular tachycardia, ventricular fibrillation, sinoatrial block and AV block. In individuals with suspected digoxin toxicity, a serum digoxin concentration, serum potassium concentration, creatinine, BUN, and serial electrocardiograms is obtained. In digoxin toxicity, the finding of frequent premature ventricular beats (PVCs) is the most common and the earliest dysrhythmia. Sinus bradycardia is also very common. In addition, depressed conduction is a predominant feature of digoxin toxicity. Other ECG changes that suggest digoxin toxicity include bigeminal and trigeminal rhythms, venticular bigeminy, and bidirectional ventricular tachycardia. The level of digoxin for treatment is typically 0.5-2 ng/mL. Since this is a narrow therapeutic index, digoxin overdose can happen. A serum digoxin concentration of 0.5-0.9 ng/mL among those with heart failure is associated with reduced heart failure deaths and hospitalizations. It is therefore recommended that digoxin concentration be maintained in approximately this range if it is used in heart failure patients. High amounts of the electrolyte potassium (K+) in the blood (hyperkalemia) is characteristic of digoxin toxicity. Digoxin toxicity increases in individuals who have kidney impairment. This is most often seen in elderly or those with chronic renal insufficiency or end-stage kidney disease. 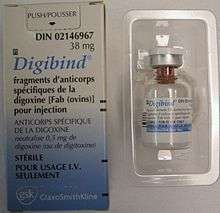 The primary treatment of digoxin toxicity is digoxin immune fab, which is an antibody made up of anti-digoxin immunoglobulin fragments. This antidote has been shown to be highly effective in treating life-threatening signs of digoxin toxicity such as hyperkalemia, hemodynamic instability, and arrhythmias. Fab dose can be determined by two different methods. First method is based on the amount of digoxin ingested whereas the second method is based on the serum digoxin concentration and the weight of the person. Other treatment that may be used to treat life-threatening arrhythmias until Fab is acquired are magnesium, phenytoin, and lidocaine. Magnesium suppresses digoxin-induced ventricular arrhythmias while phenytoin and lidocaine suppresses digoxin-induced ventricular automaticity and delay afterdepolarizations without depressing AV conduction. In the case of an abnormally slow heart rate (bradyarrhythmias), Atropine, catecholamines (isoprenaline or salbutamol), and/or temporary cardiac pacing can be used. ↑ Gheorghiade, M; van Veldhuisen, DJ; Colucci, WS (30 May 2006). "Contemporary use of digoxin in the management of cardiovascular disorders.". Circulation. 113 (21): 2556–64. doi:10.1161/circulationaha.105.560110. PMID 16735690. 1 2 Ma, G; Brady, WJ; Pollack, M; Chan, TC (February 2001). "Electrocardiographic manifestations: digitalis toxicity.". The Journal of Emergency Medicine. 20 (2): 145–52. doi:10.1016/s0736-4679(00)00312-7. PMID 11207409. 1 2 Eichhorn, EJ; Gheorghiade, M (2002). "Digoxin.". Progress in cardiovascular diseases. 44 (4): 251–66. doi:10.1053/pcad.2002.31591. PMID 12007081. ↑ Dugdale, David. "Digitalis toxicity". MedlinePlus. Retrieved 30 October 2014. 1 2 Bhatia, SJ (July 1986). "Digitalis toxicity--turning over a new leaf?". The Western journal of medicine. 145 (1): 74–82. PMID 3529634. ↑ Ahmed, A; Rich, MW; Love, TE; Lloyd-Jones, DM; Aban, IB; Colucci, WS; Adams, KF; Gheorghiade, M (January 2006). "Digoxin and reduction in mortality and hospitalization in heart failure: a comprehensive post hoc analysis of the DIG trial.". European Heart Journal. 27 (2): 178–86. doi:10.1093/eurheartj/ehi687. PMC 2685167 . PMID 16339157. 1 2 Yang, EH; Shah, S; Criley, JM (April 2012). "Digitalis toxicity: a fading but crucial complication to recognize.". The American Journal of Medicine. 125 (4): 337–43. doi:10.1016/j.amjmed.2011.09.019. PMID 22444097. ↑ Antman, EM; Wenger, TL; Butler VP, Jr; Haber, E; Smith, TW (June 1990). "Treatment of 150 cases of life-threatening digitalis intoxication with digoxin-specific Fab antibody fragments. Final report of a multicenter study.". Circulation. 81 (6): 1744–52. doi:10.1161/01.cir.81.6.1744. PMID 2188752.